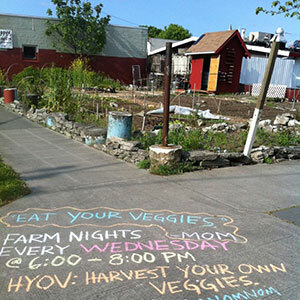 Founded in 2010, Seattle’s Alleycat Acres currently consists of three small farms that serve their surrounding communities not only with a place to reconnect with their food source, but also a shared space to regain the meaning of community in the urban setting. Scott MacGowan is one of Alleycat Acre’s original founders, focusing on educational programming and logistics for the current and future farm plots. “There is a cultural shift that has to happen,” says MacGowan. “People need to start growing more food, have more community get-togethers and share resources; more of those traditional farming practices. We’ve got to figure out ways to bring it back. And by negotiating with private landowners for abandoned residential lot use, Alleycat Acres is doing just that. Currently, the collective consists of three farms, each approximately the size of two to three residential lots and organized under the joint leadership of the collective’s steering committee and the community in which it is situated. By organizing community meetings, listening to feedback and the wants of the volunteers, Alleycat Acres helps facilitate the creation of shared green space. “We’re trying to strike a balance between freedom of expression and giving them structure,” says MacGowan. Each farm has a manager that receives a seasonal stipend to oversee production and harvest. The manager organizes weekly work parties to harvest the crops. Volunteers are not required to work a certain number of hours to receive food and are welcome to harvest whenever they wish. There is no charge for the food produced on the farm and it is available to anyone who wants it. Rather than causing a problem, this open-door policy has encouraged a sense of ownership and teamwork. Often there is excess harvest, which is donated to area food banks, according to MacGowan. Two of the farms are home to bee hives, providing the raw materials for Alleycat Honey. By collaborating with Bob Redmond of the Urban Bee Company, the hives not only produce honey but educational opportunities for adults and children alike. One farm is home to chickens, providing families with fresh eggs from chickens they have helped care for. The collective utilizes drip irrigation and compost (both made on site by resident “compost savant” Clare Donahue and the tightly regulated human waste compost). All the produce is grown organically and the urban soil bends to the will of the committee’s soil scientists. Sustainable Seattle is Alleycat Acres “fiscal sponsor” providing guidance on money management as well as keeping the collective abreast of funding opportunities. The collective has an annual fundraiser in early May, “Streets & Beets” in which folks take part in a sponsored bike race. So far, the fundraiser has supported projects on all three farms as well as providing money for equipment, seeds and in the case of one farm, property taxes. Future plans for Alleycat Acres include registering as a 501c3 to increase their opportunity to apply for grants, exploring the idea of a CSA program, and having enough money to pay farm managers a more generous stipend for their work. MacGowan hopes that soon the steering committee will have a small office from which to work, making additional fundraisers and farms easier to coordinate. According to MacGowan, the folks behind Alleycat Acres have enjoyed making something out of nothing, finding ways to reduce their impact and increase a sense of community spirit.